A good album shouldn’t be cause for distress, but in the case of Bosch’s With You, things couldn’t have been more tragic. Right after the recording sessions of their latest album Wired Promise To Be, band leader Dima T. Pilot passed away unexpectedly at a much too young age. When I first encountered this Russian band a few years ago, they were a promising instrumental post rock band who had enough know-how to keep their songs gripping throughout their generous lengths. Their previous CD saw the quartet not only considerately matured, but also finally setting themselves apart from the American post rock sound. On this unfortunately last record, they fine-tuned their style into something rather unique. Wired Promise To Be runs at over seventy minutes, and that with only five songs! With running times between nine minutes on the opener Caught Inside and twenty-two minutes on the final piece Metathesis, the songs promise straightaway incredible musical journeys, and never disappoint. 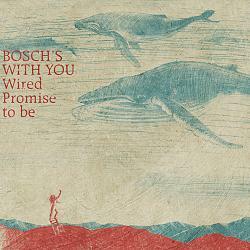 Although Bosch’s With You have a very keen ear for dynamic tension build-up, they have disassociated their style from what is currently labelled post rock. Instead the band excels in weaving dreamy ambient moods into subtly growing sonic tapestries that come with all the sense of drama that self-respecting cinematic rock music aspires to. It would be pointless to pick any special song, because the whole album works as an entity of mind-blowing ambient post rock performed by one of the few bands that managed to find their own stylistic corner. Bosch’s With You have possibly never had mass appeal, but their intensely beautiful music will continue to haunt us for many years to come. Dima T. Pilot may no longer be among us, but his genial body of work makes sure that he will never be forgotten!